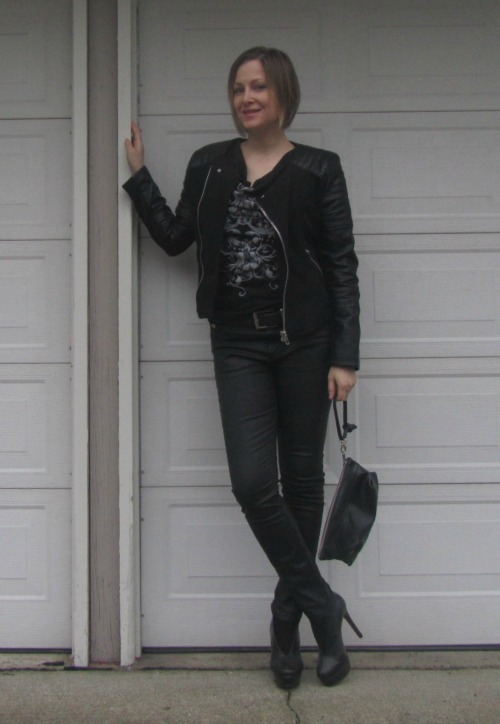 A few years ago, I found a pair of black leather Louboutins at a consignment shop. They were still expensive, but much more within reach than a new pair. I bought them. I also liked that since they weren’t new, I could buy them (I’d been staying away from new leather since I went vegan in 2000). Well, I’ve had a change of heart. 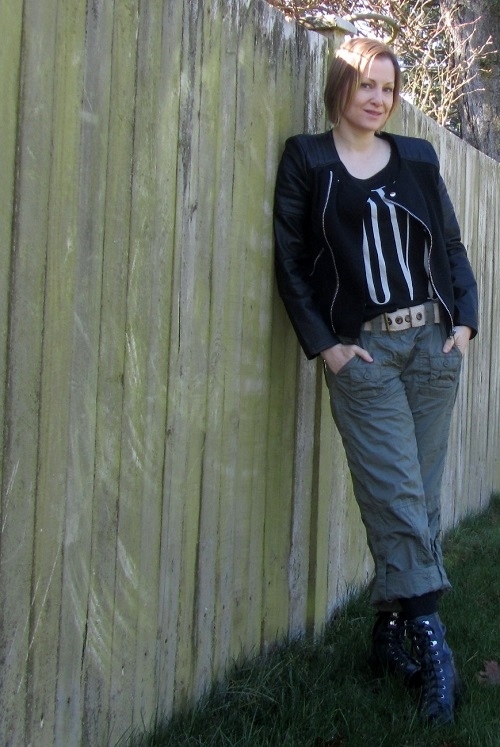 I don’t even wear used leather now because there are so many alternatives and I prefer to support vegan companies like Cri de Coeur and Novacas. Audrey Brook might not be a coveted brand or household word, and they don’t have a trademark red sole, but they fit well, are made of synthetic material, and cost 5% of a pair of new Louboutins. Yes, they were $50 (the Louboutins were $995 new). The new ones aren’t quite as high, but that’s fine with me. Weather you stay away from leather or are just looking for not spend all your rent money on a pair of shoes, these will do the trick! I feel a little tough in this outfit. Sure the t-shirt says “love,” but the style is all attitude. If you know me though, you know I can’t really be a tough chic–as much as I’d like to. I got this jacket at Forever 21. Nothing to be proud of really, but it was a non-leather replacement for a leather jacket I got rid of. Sometimes going cheap is a good way to get vegan leather alternatives–as long as it doesn’t fall apart and end up in a landfill in two weeks! My boots are also faux. They’re G by Guess, and I guess that’s their lower-end line. Suits me fine. They’re comfortable and who doesn’t want a nice combat boot? I’ve even worn these with long and short skirts for a 90s grunge vibe. 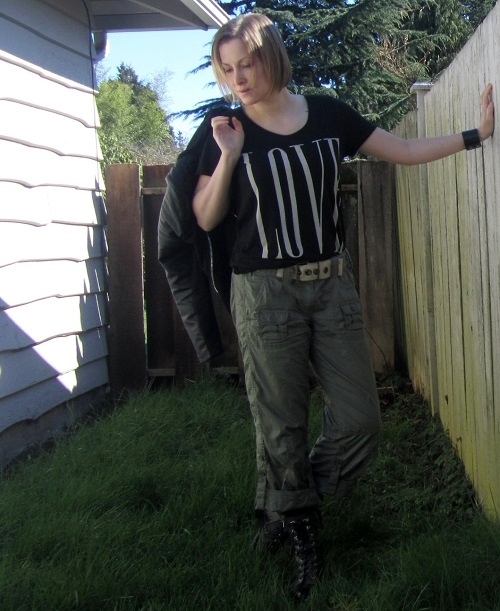 True confession: I wore this exact outfit to Portland when I saw Morrissey perform a few months back. I don’t often repeat outfits exactly, but I like this one. 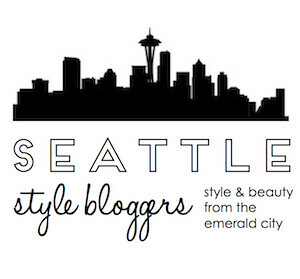 Today I’ve joined up with the Anything & Everything blog hop at My Thrifty Chic. 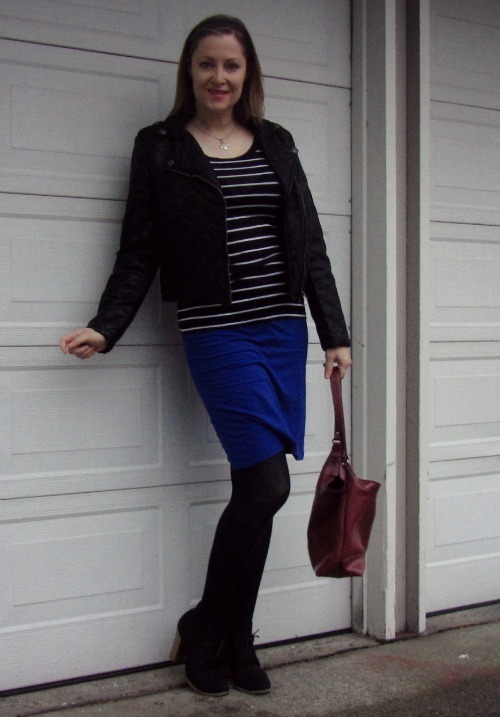 Anything goes, so hop on over and see what other people are wearing, making or doing. Last Saturday I went to an eco-fashion themed fashion show. 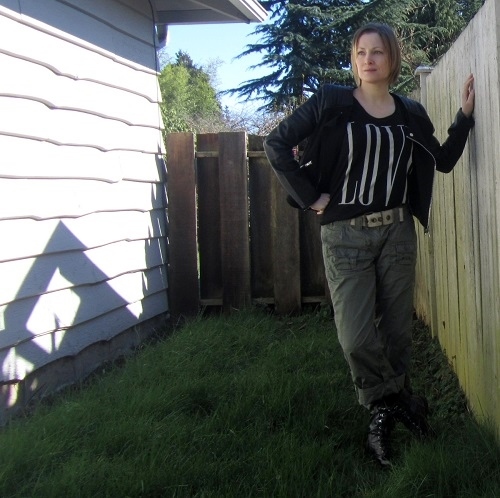 I wanted to dress the part: stylish yet eco-conscious. Here’s the outfit I put together. 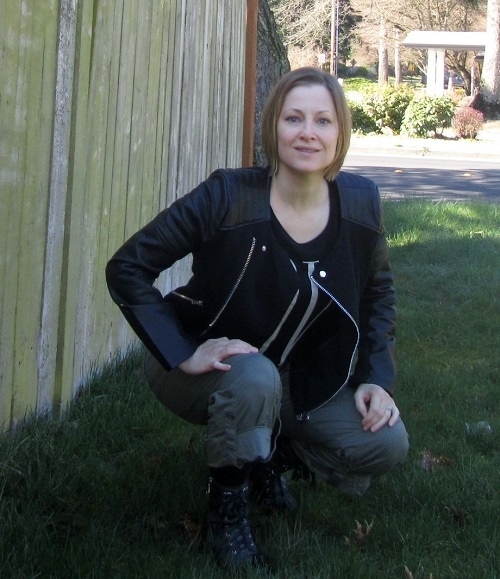 The jacket is cotton and faux leather. And while we could debate the sustainability of pleather made overseas, I’m giving myself points for choosing non-leather. By the same token, the jeans are glazed denim, a leather alternative, and so is the clutch. That one I can really get behind. It’s by a local designer, Crystalyn Kae, and is very eco-friendly. The shoes are leather, but I bought them second hand. Points for recycling! My shirt is swapped, so again, I’ll count that as recycling. 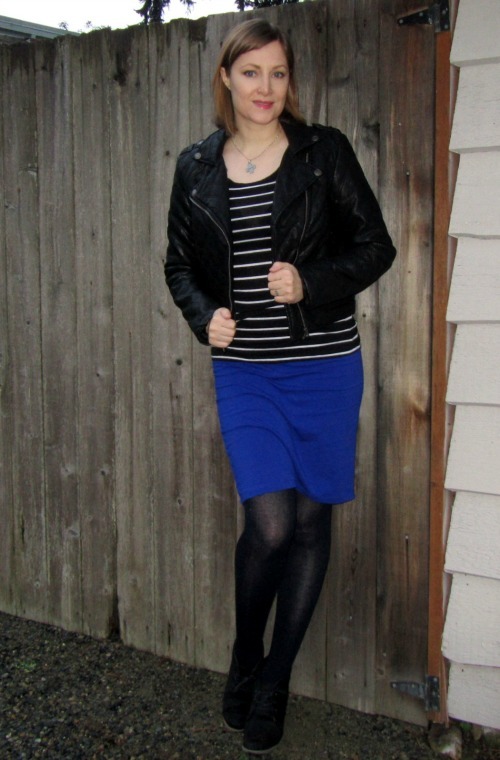 The leather cuff was once a belt–upcycled! And the belt is all-vegan and US-made. Regardless of how good a score I got on the eco-front, I tried, and I had a lot of fun in this outfit. 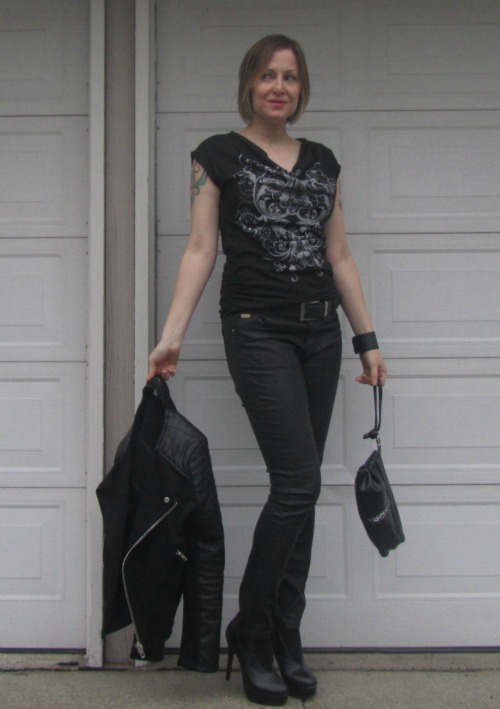 I felt a little like Joan Jett! 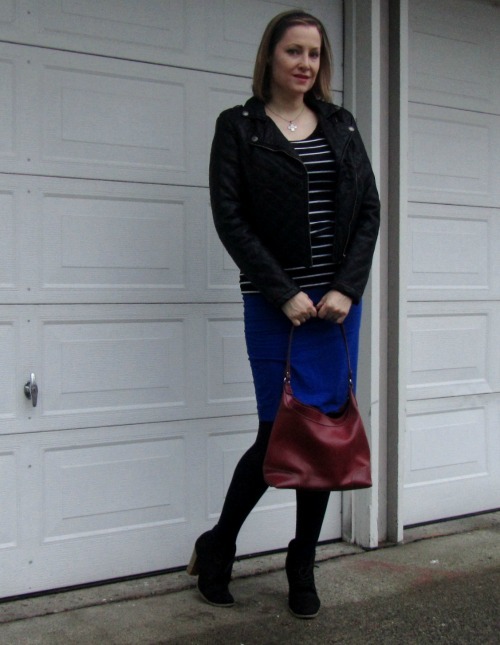 I’m linking up to What I Wore Wednesday at The Pleated Poppy and Transatlantic Blonde. Be sure to check out what everyone else is wearing! I love this jacket! I bought it from an online eBay store. It came all the way from Hong Kong. 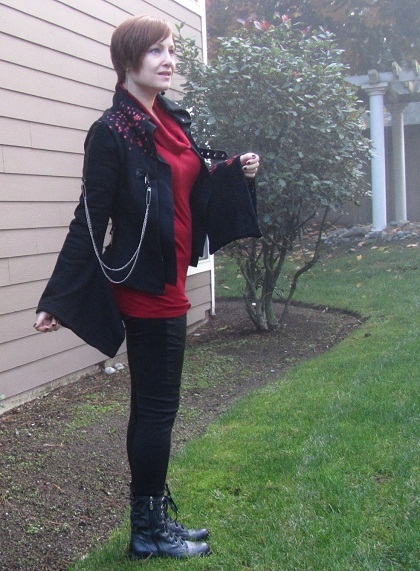 I love the wide sleeves and red and black color combo. 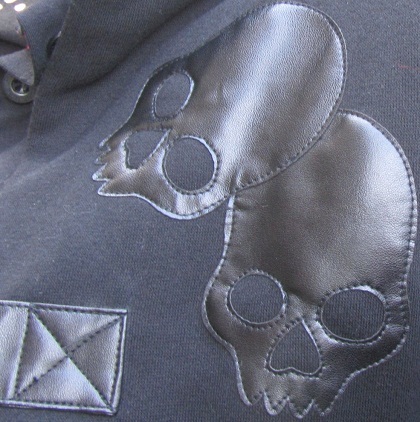 It’s got a faux leather skull appliqué but it also has floral fabric that lines the sleeves and floral detailing on the shoulder. It has balance. I feel like I can take on the world when I wear this jacket. 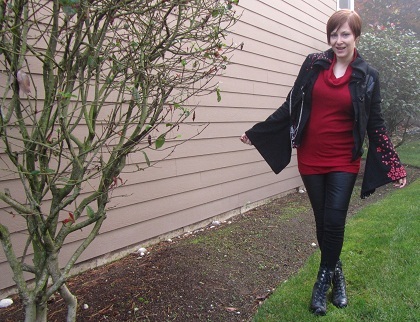 Today I paired it with my leggings with the faux leather panels and combat-styled boots. I’ve worn this only once before, but that’s going to change. I’ll throw this on more often and not save it for the “right occasion.” Besides, it’s fleece-lined so it’s warm and cosy. Perfect for a Seattle winter (and spring, summer and fall). Maybe it was the fog we had this morning but I think I could hunt and kill zombies in this jacket. And who knows? They might be out there. Last weekend, when I was downtown Seattle looking at art, I took a detour into Endless Knot, a small, eclectic women’s boutique on First Avenue in the Belltown neighborhood and bought two fabulous purses. I’m not sure why I hadn’t gone into the shop before. They have a great selection of unique clothing and accessories. Lots of great dresses and separates, and jewelry too. I will definitely be back. I was somewhat constrained by time, so I made an agreement with myself not to try anything on. If I went down that road, I’d be a while. So I stuck to idea-gathering and accessory-shopping. I noticed a few nice bags, and passed them over. On my second lap of the store, I returned to them. I felt the soft, smooth leather…wait, that’s not leather. Is it? I don’t eat animals, so I figured it makes sense to not wear them either. 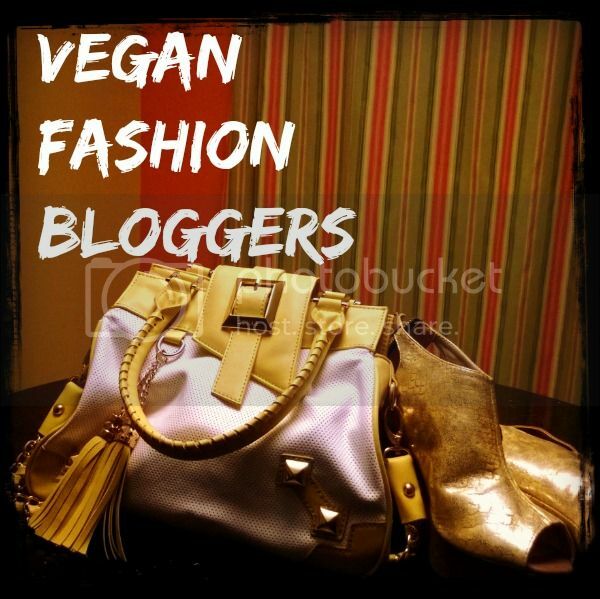 I strive to buy ethical, green, non-animal-product clothing, shoes, and accessories. 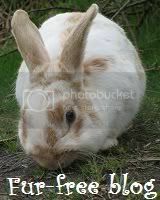 Sometimes I falter, but I’m usually pretty good about it. And why not? 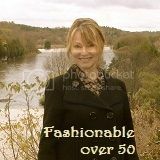 It’s easier than ever to find faux fashions (well, the fashions are real, the materials are faux). When I found the rich-looking jewel-toned purses by shiraleah—and then read the label— felt I didn’t have a choice but to vote with my dollars. 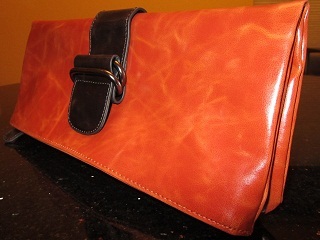 The burnt orange clutch with deep chocolate accents and silver-tone hardware is lined with striped brown and cream cotton fabric and zips closed. It’s actually double the size that it appears because it’s a fold-over clutch; it holds together with magnets discretely hidden within. It was $32. 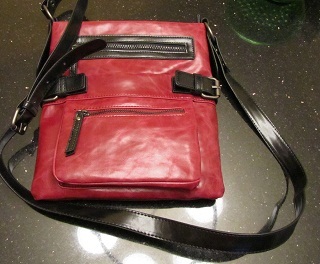 The wine-colored cross-body bag has black accents and a plaid lining. It has an extra strap so I can change it to a shoulder bag. It was $86. These bags will be making appearances in my outfit photos soon, you’ll see. I bought a smaller, stone-colored, three zipper cross-body bag by shiraleah when I visited my family in Canada last summer. So my shiraleah vegan purse collection is complete (for now).